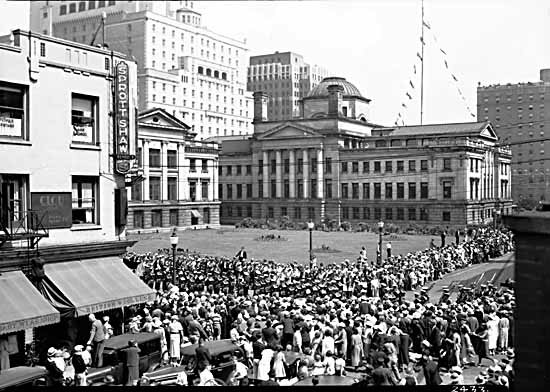 The first courthouse built in Vancouver in 1888, and will be demolished in 1912. It will become Victory square in 1924. 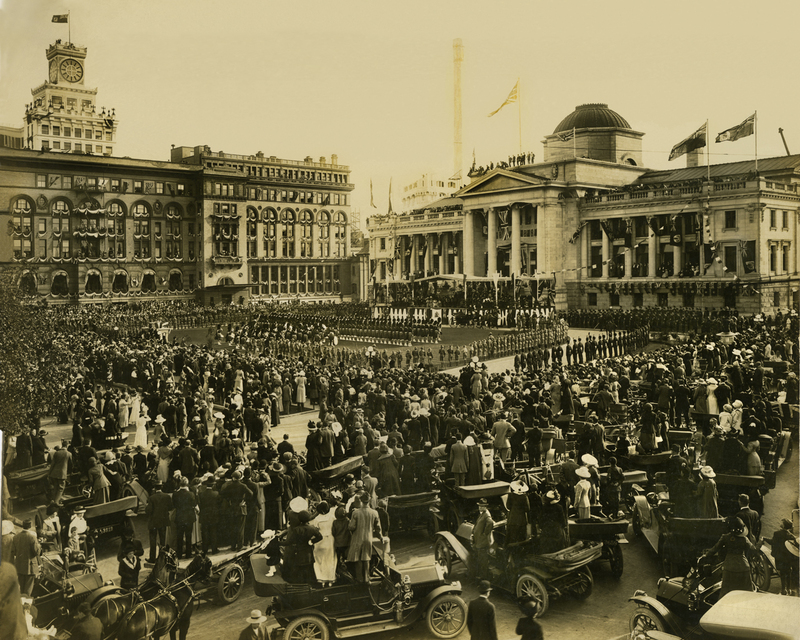 At the turn of the century the court house was located on what is now Victory square. It will be relocated on Georgia in 1912 in the building designed by Francis Mawson Rattenbury. (nowadays house of the VAG). The annex facing Robson will be added in the 30s. 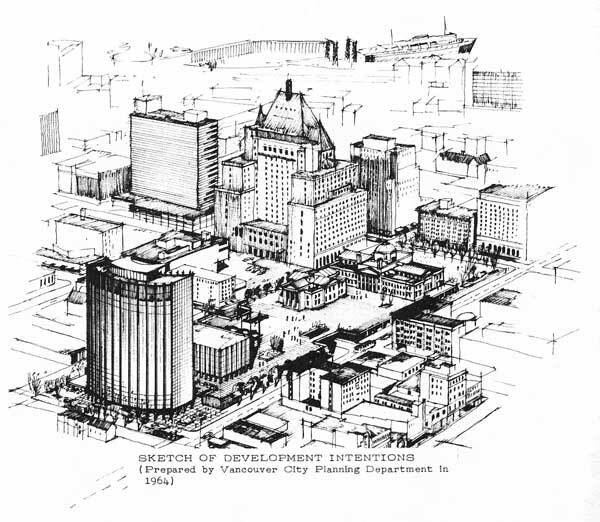 City of Vancouver was eyeing the Block 61 (South of the today VAG), to transform the whole area in a civic center, by relocating noticeably the public library and the BC electric building. 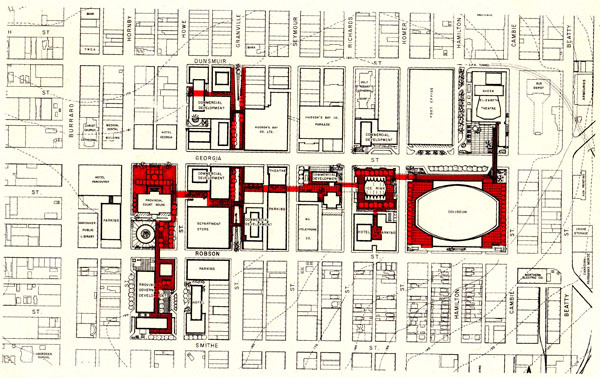 After an exhaustive study to select a location for a public space in 1958, block 61 is selected in 1960. Retail corridors like Hasting were already seriously declining and the city was not seeing commercial development on block 61 as desirable. The city strongly opposed to the Province proposal for this reason. 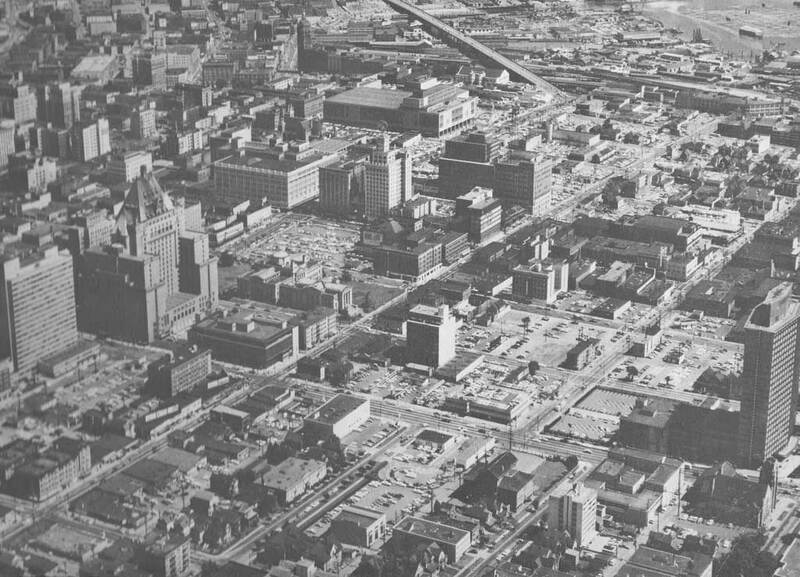 1966-1972 : Where is the square? 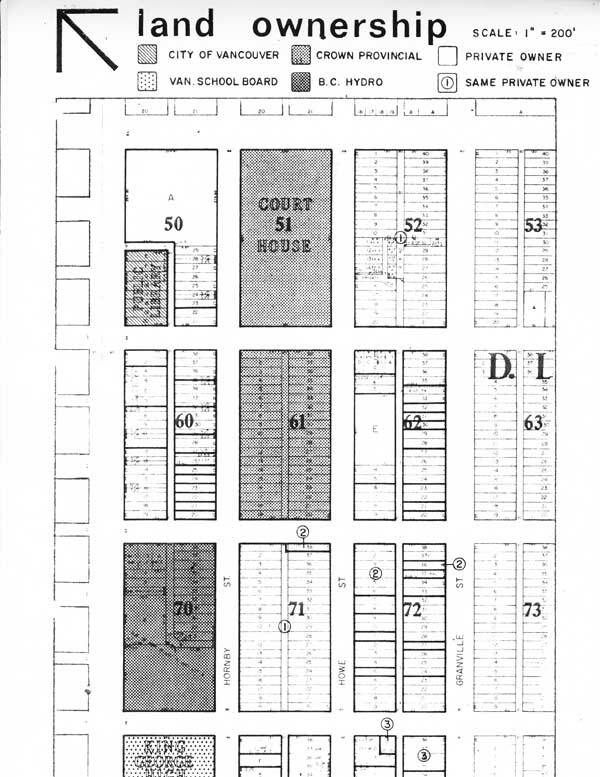 block 71 as a civic square., a then considered very poor alternative. block 42 because it was owned by the city (purchased with the proceed of the block 61 sale). 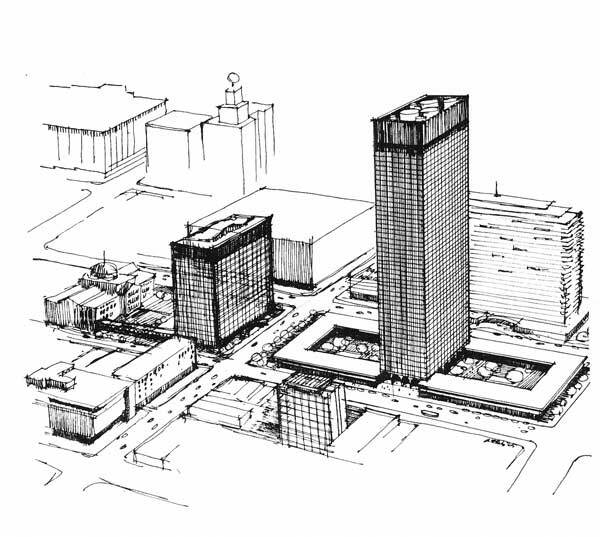 In the meantime, the city acquired block 71 from Eaton, since the site was considered as suitable for a ‘central’ park, if not a civic square, and could be used to trade with other properties, again echoing the erickson 66 proposal. 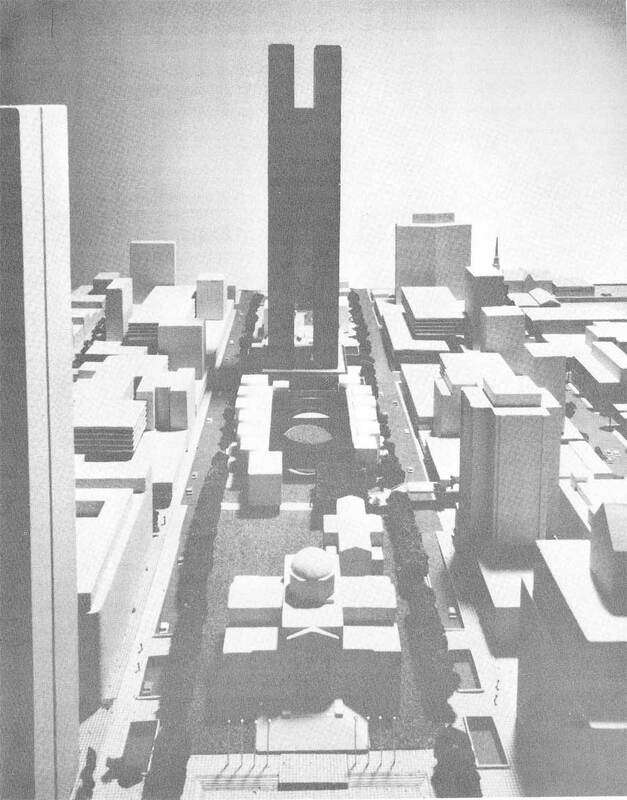 While the city engineering department was considering the provided parking space (630), as noticeably insufficient (they were asking for 1200), the civic design panel had considered that “the tower structure itself, is well designed and in an acceptable location” but that the “most important problem is considered the lack of open space separation between the proposed new building and the [old] court house”. …Needless to say the resident had a very different opinion on the slab-tower. More informal gathering space was at Larwill park, at Georgia and Beatty. 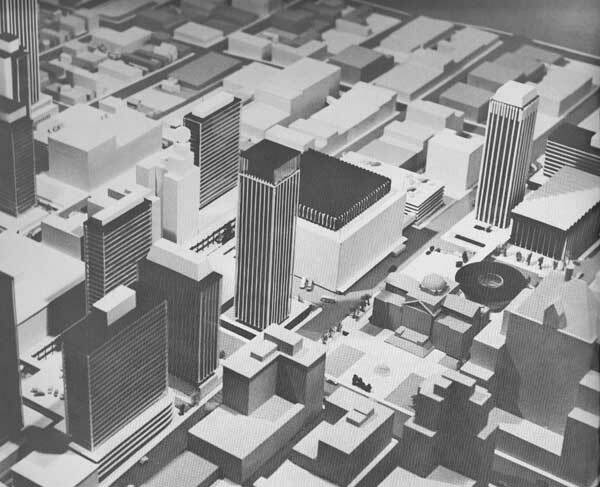 Redevelopment in downtown Vancouver : report No 5, City of Vancouver, 1964.